During the 4th to 13th centuries there was a unique culture on the coast of contemporary Vietnam, owing its spiritual origins to the Hinduism of India. This is graphically illustrated by the remains of a series of impressive tower-temples in a dramatic site that was the religious and political capital of the Champa Kingdom for most of its existence. 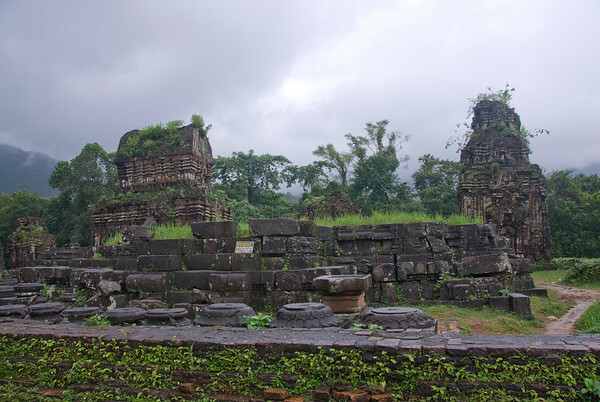 The tower temples were constructed over ten centuries of continuous development in what was the heart of the ancestral homeland of the ruling Dua Clan which unified the Cham clans and established the kingdom of Champapura (Sanskrit for City of the Cham people) in 192 CE. During the 4th to 13th centuries CE this unique culture, on the coast of contemporary Viet Nam, owed its spiritual origins to the Hinduism of the Indian sub-continent. Under this influence, many temples were built to the Hindu divinities such as Krishna and Vishnu, but above all Shiva. Although Mahayana Buddhist penetrated the Cham culture, probably from the 4th century CE, and became strongly established in the north of the kingdom, Shivite Hinduism remained the established state religion. If you visit the smaller, more distant temples in Angkor, you’ll have an idea of what My Son is like. The architectural styles are very similar and both are of ancient Hindu origin. My trip to My Son was rather disappointing. It is about an hour drive from Hoi An and is up in the hills. On the day I went, it was raining heavily so what few photos I took had to be taken under an umbrella. It is also much smaller than I assumed it would be. Even in the rain, I was able to walk around the entire grounds in about an hour. While it is only a fraction of the size of Angkor, the visitor center and facilities are much better than anything you will see in Cambodia. If you are in Hoi An it is worth the trip, but if you are expecting anything like the temples you can see in Angkor you will be disappointed. 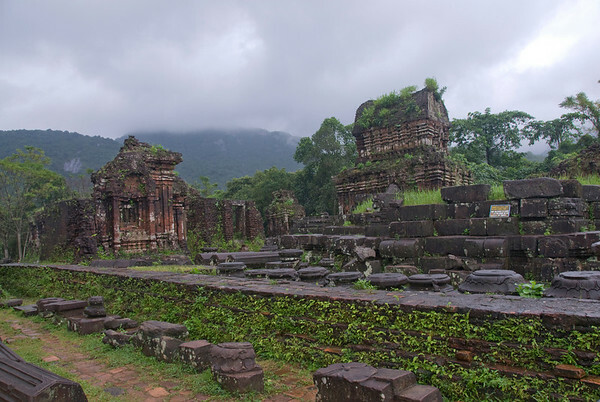 My Son Sanctuary is a cluster of Hindu temples that had been abandoned in the Quang Nam province of Vietnam. It is a cultural site that was recognized as one of the UNESCO World Heritage Sites in Vietnam in 1999. These temples were traced back to somewhere between the 4th to 14th century AD. They were constructed for by the kings of Champa and were built in dedication to the Hindu god, Shiva. They are known locally in a variety of names although it is best referred to locally as Bhadreshvara. 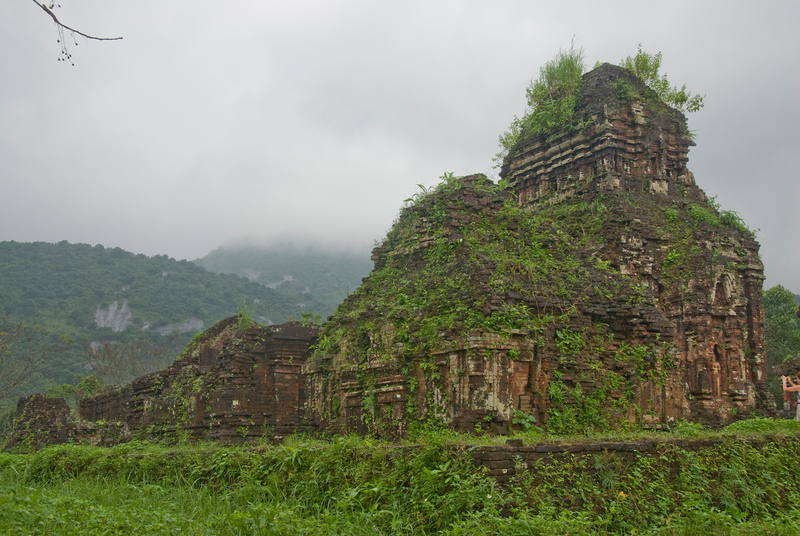 The temples of My Son Sanctuary are located in a valley near the village of Duy Phu. The valley measures at two kilometers wide with two mountain ranges surrounding it. It is believed that this temple and its ruins are the longest inhabited archaeological site within the Indochina region. However, several parts of the temple were destroyed during the US bombing at the Vietnam War. If you want to visit My Son Sanctuary in Vietnam, there are plenty of transportation options available. First, you can travel by car from Hoi An. You can drive by Hung Vuong Street until you reach the town of Vinh Dien. The drive from Hoi An to My Son Sanctuary is about 1 hour. Hence, it is a popular day trip for those who are staying in Hoi An. There are also several tour companies operating in Vietnam that offer tours to My Son Sanctuary. This is the most famous option for those who want to see the world heritage site. There are sunrise tours that enable you to reach the site very early in the morning. Meanwhile, there are also regular tours that are expected to arrive in the site by 8:30 AM. You can also take a taxi to drive you to My Son Sanctuary. You can pay your taxi driver $70 to drive you for a day to the site, return trip included. If you must visit the My Son Sanctuary, do so in the early morning. That way, it is not too hot and you can avoid the crowd. There were at least 68 temples and structures that were originally part of the complex. However, only about 20 of them had survived today. This temple complex is relegated as one of the most important religious and intellectual centers of the Champa Kingdom. It was also a burial place for the Cham monarchs. It was the French who discovered this ancient site in the late 19th century. 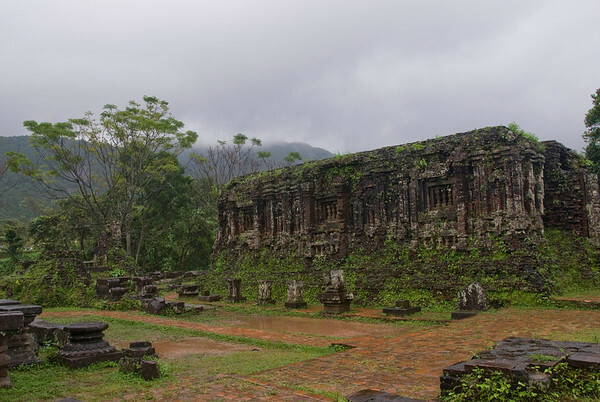 Since then, the complex has been restored only to be devastated during the Vietnam War. During the reign of the Kingdom of Champa, My Son Sanctuary served as the political and religious center. There were close to 70 structures that were built in honor of the Hindu god Shiva. Shiva was considered as the protector of the Champa’s kings, which is why they built this temple in honor of the Hindu god. The materials used for building the temples and other structures within the complex are red bricks and sandstone. As with many other historic sites in the world, even UNESCO sites, this temple complex was destroyed by war and time. It was also neglected and abandoned for several centuries until the French discovery in the late 19th century (specifically in 1898). Unfortunately, the US war in Vietnam did not help in the conservation efforts at the site as the bombs placed by the US Army destroyed some of the surviving structures at My Son Sanctuary. The Viet Cong used the site as a hiding place assuming that the US would not bomb a historical site. They were mistaken and so the remaining structures at the site underwent more damage after the war is over. Today, and especially after it has been named as a heritage site by UNESCO, My Son Sanctuary is slowly being re-built. There are also some reconstruction efforts being done in some parts of the site. Many visitors who get to see My Son Sanctuary are reminded of other Hindu temples in Asia, most notably the Angkor Wat in Cambodia. View the complete list of UNESCO World Heritage Sites in Vietnam. The best time to go to My Son is on the ‘sunrise’ trips offered from Hoi An. It’s not really a sunrise — the gates don’t open till after the sun’s up — but you beat the huge crowds (and mid-day heat). When I did it last year, I essentially had the place to myself. I agree that it’s not as impressive as a Bagan or Angkor Wat, but it’s VN’s biggest site, and I’d say worth a few hours if you’re in the area.